What is Repeated Measures ANOVA? 1. What is Repeated Measures ANOVA? 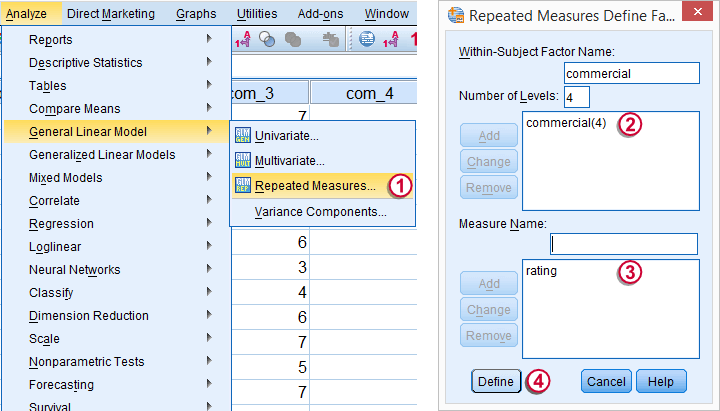 SPSS repeated measures ANOVA tests if the means of 3 or more metric variables are all equal in some population. If this is true and we inspect a sample from our population, the sample means may differ a little bit. Large sample differences, however, are unlikely; these suggest that the population means weren't equal after all. The simplest repeated measures ANOVA involves 3 outcome variables, all measured on 1 group of cases (often people). Whatever distinguishes these variables (sometimes just the time of measurement) is the within-subjects factor. A marketeer wants to launch a new commercial and has four concept versions. She shows the four concepts to 40 participants and asks them to rate each one of them on a 10-point scale, resulting in commercial_ratings.sav.Although such ratings are strictly ordinal variables, we'll treat them as metric variables under the assumption of equal intervals. Part of these data are shown below. 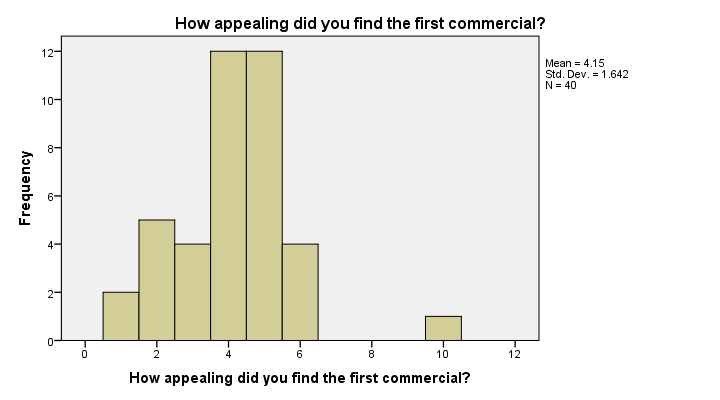 The research question is: which commercial has the highest mean rating? We'll first just inspect the mean ratings in our sample. We'll then try and generalize this sample outcome to our population by testing the null hypothesis that the 4 population mean scores are all equal. We'll reject this if our sample means are very different. Reversely, our sample means being slightly different is a normal sample outcome if population means are all similar. Independent observations (or, more precisely, independent and identically distributed variables). This is often -not always- satisfied by each case in SPSS representing a different person or other statistical unit. The test variables follow a multivariate normal distribution in the population. However, this assumption is not needed if the sample size >= 25. Sphericity. This means that the population variances of all possible difference scores (com_1 - com_2, com_1 - com_3 and so on) are equal. Sphericity is tested with Mauchly’s test which is always included in SPSS’ repeated measures ANOVA output so we'll get to that later. Before jumping blindly into statistical tests, let's first get a rough idea of what the data look like. Do the frequency distributions look plausible? Are there any system missing values or user missing values that we need to define? For quickly answering such questions, we'll open the data and run histograms with the syntax below. *Run histograms for 4 variables without frequency tables. First off, our histograms look plausible and don't show any weird patterns or extreme values. There's no need to exclude any cases or define user missing values. Second, since n = 40 for all variables, we don't have any system missing values. In this case, we can proceed with confidence. We may freely choose a name for our within-subjects factor. We went with “commercial” because it's the commercial that differs between the four ratings made by each respondent. We may also choose a name for our measure: whatever each of the four variables is supposed to reflect. In this case we simply chose “rating”. 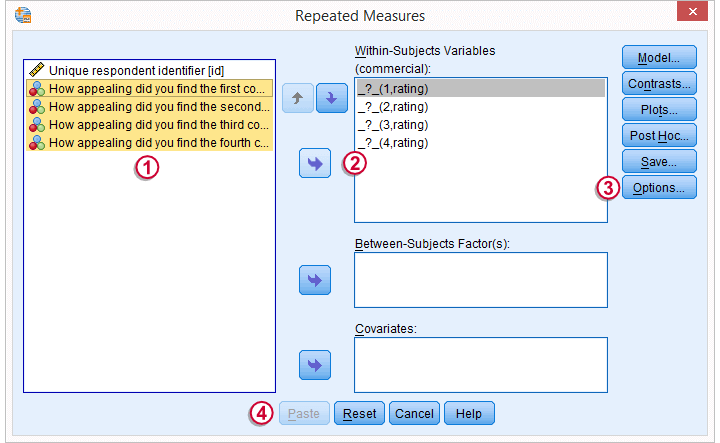 We now select all four variables and move them to the Within-subjects variables box with the arrow to the right. Under Options we'll select Descriptive statistics. First off, we take a look at the Descriptive Statistics table shown below. Commercial 4 was rated best (m = 6.25). Commercial 1 was rated worst (m = 4.15). Given our 10-point scale, these are large differences. We now turn to Mauchly's test for the sphericity assumption. As a rule of thumb, sphericity is assumed if Sig. > 0.05. For our data, Sig. = 0.54 so sphericity is no issue here. The amount of sphericity is estimated by epsilon (the Greek letter ‘e’ and written as ε). There are different ways for estimating it, including the Greenhouse-Geisser, Huynh-Feldt and lower bound methods. If sphericity is violated, these are used to correct the within-subjects tests as we'll see below.If sphericity is very badly violated, we may report the Multivariate Tests table or abandon repeated measures ANOVA altogether in favor of a Friedman test. Since our data seem spherical, we'll ignore the Greenhouse-Geisser, Huynh-Feldt and lower bound results in the table below. We'll simply interpret the uncorrected results denoted as “Sphericity Assumed”. The Tests of Within-Subjects Effects is our core output. Because we've just one factor (which commercial was rated), it's pretty simple. Our significance level, Sig. = .000. So if the means are perfectly equal in the population, there's a 0% chance of finding the differences between the means that we observe in the sample. We therefore reject the null hypothesis of equal means. The F-value is not really interesting but we'll report it anyway. The same goes for the effect degrees of freedom (df1) and the error degrees of freedom (df2). the outcome of the within-subjects tests. When reporting corrected results (Greenhouse-Geisser, Huynh-Feldt or lower bound), indicate which of these corrections you used. We'll cover this in SPSS Repeated Measures ANOVA - Example 2. Thank you! I asked this simple question of how to report a repeated measures anova result to many people and professors, and this was the only one to give me proper clarity. Better than my online university provision, which is already not bad. This analysis has been on our to-do list for a long time but it may take another while before we'll have the time to write it. In short, the analysis will be pretty similar to between-subjects ANOVA with 2 factors: first inspect if there's an interaction. If yes, proceed with simple effects -analyze one factor for each level of the other factor separately. If no, inspect if there's any main effects. Both approaches may be followed up by post hoc tests and/or contrasts. A tutorial you may find helpful is Two-Way ANOVA with Interaction Tutorial. This covers 2 between-subjects factors but the reasoning is very similar for 2 within-subjects factors. What about if you have 2 within subject factor?